Several of my weightloss and fitness groups focus on reaching your personal step count goal each day. Participants share their your daily step count with the group to hold themselves accountable each evening. 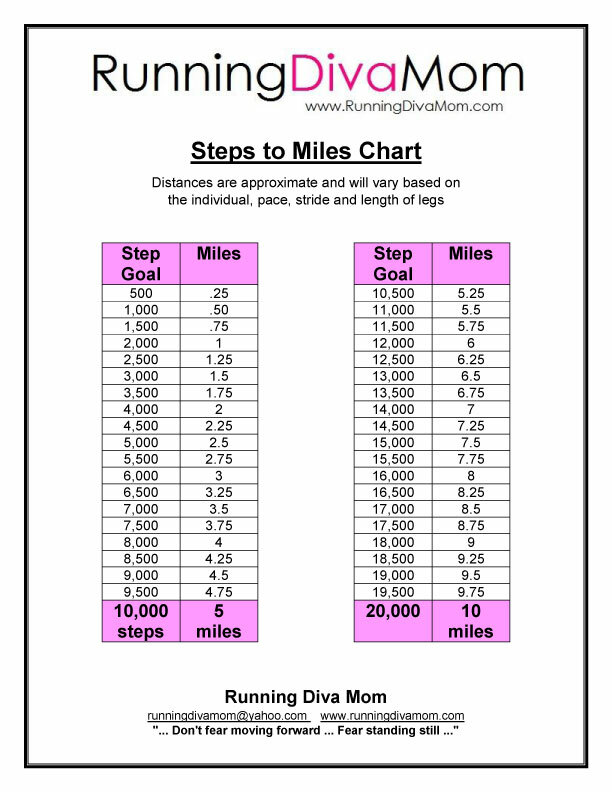 Here is an approximate steps to miles chart, if you want to plan your walking or running routes and distances. Distances are approximate and will vary based on the individual, pace, stride and length of legs. 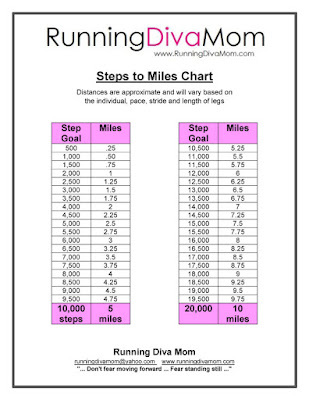 If you are interested in any of my monthly accountability group, please reach out to me at runningdivamom@yahoo.com or check out my the RDM sidebar at runningdivamom.com. One Sun Prairie mom is surpassing her fitness goals after going through a makeover this spring that focused on more than just appearances.Resident Karine Spencer spent three months working with a networking group of health and wellness professionals in Sun Prairie on fitness and overall wellness. 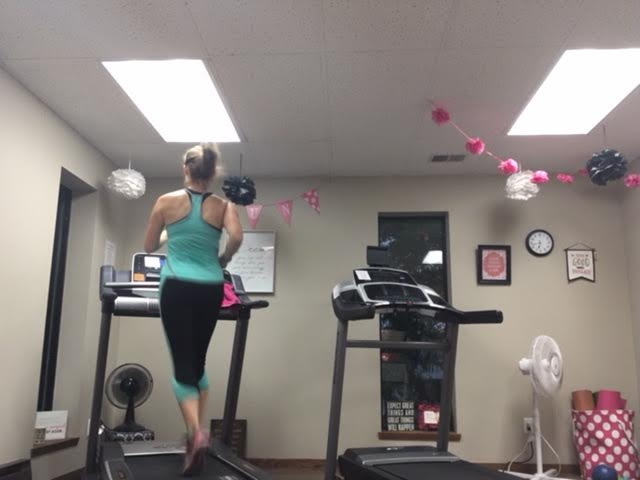 She started the journey in March, and by May had improved her body composition by 7.1 percent, according to Jamie Adcock, running coach at Running Diva Mom and a member of Spencer’s wellness team.Spencer said she had talked about making a wellness change in her life for some time, but until she had the right push and accountability to others, she said she didn’t have the follow-through to make it stick.“So when Jamie approached me about it, that was the push I need,” she said.With her team, Spencer said she was able to explore different approaches and find what works for her. 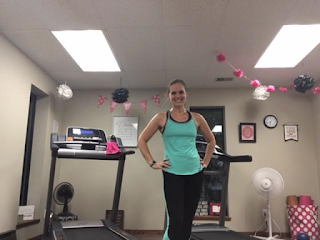 For example, she said she doesn’t’ love running but enjoyed the group dynamic at A&B Fitness Concepts’ weight loss group.“That worked for me, the camaraderie, because everyone has a common goal there,” she said. “They may have different ideas of how to get there and what helps them the most, but they’re all there to pull each other and push each other a little and share.”Spencer’s team of wellness professionals in Sun Prairie also included Storm Fitness and Noble Choice Chiropractic, LLC. 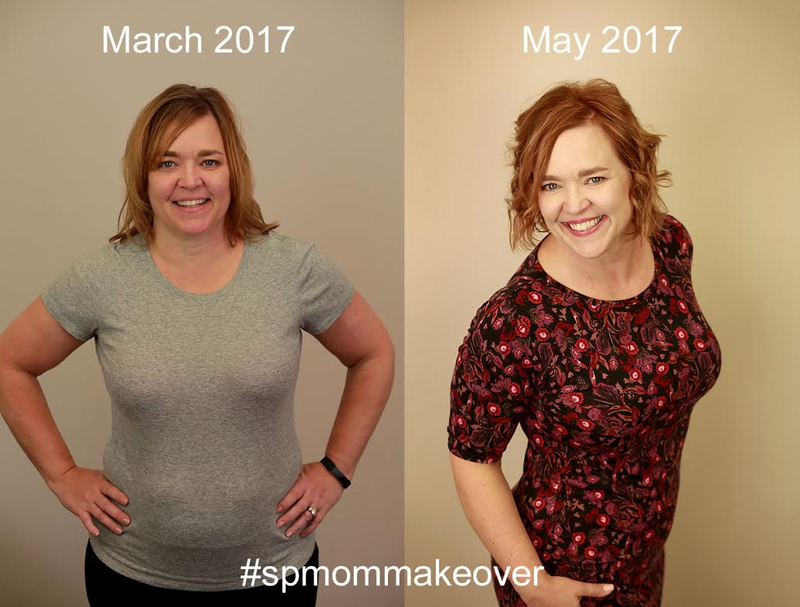 And Spencer got a traditional makeover, too, from local businesses Lularoe Jessica Lobner, Hair Affection and before-and-after photography by Rachel Manzke Photography.But making a broad change required determination on Spencer’s part. Adcock said Spencer always showed up to sessions with a positive attitude, and asked questions and changed her plans to make herself successful.“It was remarkable watching her grow through running but also to watch her mindset change, her body transform and become stronger, her wardrobe evolve and her confidence soar,” Adcock said in an email. “Karine is truly one-of-a-kind and beautiful inside and out.”At the end of the wellness makeover, Spencer proved her progress by completing a 5K race. Spencer has now also completed 8K and 10K races, and will participate in a 10-mile race at the end of July. She said her ultimate goal is a half-marathon in October. For others who may be looking to make a lifestyle change, Adcock said it is important to start with small changes.“Making an overall lifestyle change can be intimidating,” she said in an email. “Start by tracking your nutrition every day for a week, or try walking around your block instead of running a mile. Small changes yield big results.”Another important strategy for keeping on-track is simple: do something you enjoy.“If you are going to dread your fitness routine, you most likely aren’t going to continue with it,” Adcock said. 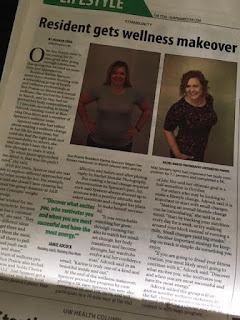 “Discover what excites you, who motivates you and when you are most successful and have the most energy.”Adcock added the group will organize another wellness makeover in the fall, choosing another mom who is focused on making a change and able to commit to a 12-week program. You may read the full article from The Star. Photos courtesy of Rachel Manzke Photography. Two weeks ago, I arrived at my goal weight. I set my sight on 143 pounds, which would leave me at the lightest I've been since my sophomore year of high school. It's just a number I came up with and seemed somewhat realistic. Even though I never even came close to it in adulthood or since having my children. I came home from the hospital at 187 pounds and have been resting around 158-160 pounds since the baby weight (and more) came off. I graduated from high school in the 170's and only went up from there. I lost weight when I took up running in 2005, but with several pregnancies and three episodes of gestational diabetes, my weight always rested between 155-160 pounds. I was comfortable, but I was uncomfortable. 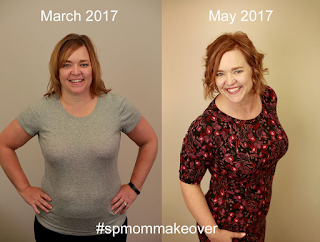 I started leading virtual weightloss challenges last fall and they've been really successful and have kick started weightloss for several women, including myself. But it wasn't until early-May when I really decided to be extremely dedicated to tracking my food and exercise. I wanted to see exactly why I wasn't losing weight with all of the running I was doing. I quickly realized that I had really good days, but I also had bad days with my diet. I felt like I deserved extra treats and crazy portions a couple days a week because I'd also burn 1,000-2,500 calories some days from running. But, I was easily consuming those calories in some meals. Tracking consistently - the good and the bad - really helped me see what I was doing. I also started sharing my food logs online with my accountability groups. This kept me on track myself. I also was proud to see how much activity I consistently fit into my days. Even when I don't run, it's pretty typical for me to log 20,000 steps or more. Sometimes closer to 30,000. People keep asking me what I've been doing to be so successful in such a short amount of time. It's simple. I'm not eating all of the calories that I'm burning. And I'm being conscious of what I'm eating. This has not been a diet for me. And I already have the lifestyle Ithat want. The process of tracking my food and exercise has simply been an eye opener. We all know what to do. I'm not different that you. It's just a matter of doing it. Doing it consistently. And being honest with ourselves. Just because you didn't track that Dairy Queen ice cream doesn't mean that you didn't actual eat it. And yes, I've enjoyed my share of DQ and Culver's. But I've opted for a cone instead of a mixer or lemon ice with fruit instead of custard. When we went camping, I packed a healthier option to chips and enjoyed Boca Burgers when my family enjoyed hamburgers. We went through a drive-thru recently and I ordered a kids meal instead of a big burger and fries. My family had birthday cake and I enjoyed an entire pint of Halo Top ice cream guilt-free. It's about choices. I've become quite religious - and sometimes annoying - about tracking my food and exercise. But if I don't do it in the moment, it's easy to forget about what all went into my salad; or how many servings of casserole I had; or how many times we went on a walk or run during the day. I'm still consuming 1,400-1,900 calories a day on average. But I'm trying to end each day with a difference of 500 calories or more consistently. 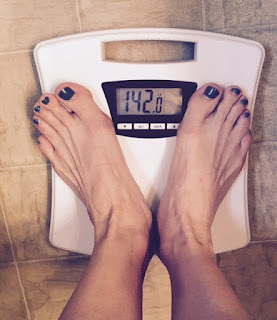 When I arrived at 143, did I feel great? Yup, you bet I did! I went downstairs crying to my husband and was so proud of myself. It was a number that I never EVER thought I'd see staring at me. Did I feel different? Yes and no. I felt great and comfortable in my skin and my clothes. But I didn't feel like a different person. I didn't feel like "Wow, I'm there. I never have to think about my weight again. I'm done". Nope. This is a lifelong journey for me and one that I want to continue. 143 is seriously just a number. I've lost a little more since that fun weigh in. And want to lose a few more pounds and then the maintenance begins. There is a reason why I have never comfortably been able to rest below 160. I'm still learning about myself. What my triggers are. Why I've binged in the past. Why I struggled with bulimia as a teen. It's awesome being comfortable with yourself and your choices. You are the only one in control of that. If you are stuck, you're really not. You're the only one standing in your way. Just be honest with yourself, open the door, and move forward. 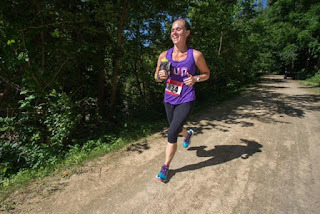 Every time I am scheduled to run another marathon, I feel like people think it's just another race or another day in the life of a running coach. Truth is - I'm scared as $&*# and have a little anxiety. I have hundreds of miles in this training cycle, but never really "train" for events anymore. I'm always coaching and fitting in miles in here in there or back to back, that my official training has pretty much been non-existent. So this always sits in the back of my mind -- am I ready? I've been nursing a sore right calf and shin. Some days it annoys me more than others. The good thing is that the longer I run and the faster I run ... the less it seems to hurt. At least up until a certain point. That leaves me with a little anxiety for tomorrow's race. 26.2 miles a really long way. Even to me. I've been doing good self-care this week. Something that I really hope to continue. I've been rolling out my legs a ton - and a ton beyond that. I'm wearing compression socks the past two days. And sneaking ice packs in them to reduce additional pain in my right leg. I've been forgetting the flip flops for weeks and wearing running shoes when I can. I also switched two a new pair about a week ago. Then there comes the other pre-marathon obsessions and rituals. Being careful to shave. Trimming your toe nails just right. Applying body glide and lotion everywhere. Checking for pebbles in your shoes. Making crazy packing lists that include every single thing that you wouldn't want to forget. Do I need to pack the toaster for my English muffin? Drinking water and sports drink like it's going out of style. Thinking and rethinking what time you will need to wake up to get to the start line. What if I over sleep? Will I sleep at all? Double and triple checking that all of your devices are well-charged. Yeah, my watch died about half way through one of my marathons last fall. But all of those things don't carry me through to the end. It's me. It's my belief in myself. A positive attitude and energy. It's me realizing that I've done it before. And that I can do it again. But most of all I will remind myself that I do this -- because I enjoy it. It's a gift. One that I will continue to unwrap and enjoy over and over again. Even though I may not feel that way at about mile 22 tomorrow. 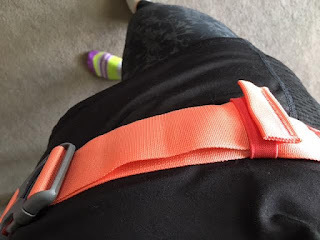 I have had some items from Hylete sitting in my drawer to try out and review. Their apparel is super soft and comfortable and feature an awesome cut. However, I wasn't feeling too comfortable in my skin, so I wasn't happy with how the racer tank fit me ... until now. I finally have had a chance to try the Insignia Racer Tank and Invex II Crops over a couple of runs. These were done both indoors and outdoors. And I really love them! The crops stayed up and never moved or slipped - something that I often struggle with. I would be hesitant about ordering bottoms online, but these worked out great. I love the matching tank too. It was longer, but not too long and the racerback is super adorable when paired with a fun sports bra. I also loved how light the tank was. Super light and airy. I typically wear a medium and both pieces were sent to me in a size medium. They didn't fit great before, but fit perfect now. I was sent the mint/black/grey combos. Both pieces are sweat-wicking. The tank comes in four different colors, including basic black. It also comes in five different sizes. The tank retails for $50 on the Hylete website. I loved the four-way stretch - who doesn't?! The crops come in a few different colors as well and retail for $70. They come in five different sizes. The smooth fit promises to be flattering to every body type and the elastic waistband stretches up to four inches. You can wear as is (like I did) for medium rise or roll the waistband for a lower fit. I'm not typically one for hydration belts. I almost always run with my handheld water bottle. But, occasionally I do find a waist belt handy - including when hiking with the kids. I don't usually like anything bulky or extra around my waist. 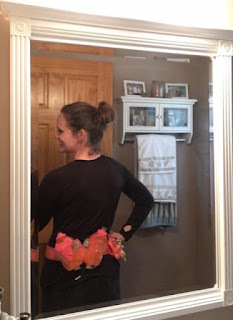 But, as I've been slimming down, I'm finding it easier to wear something around my waist. I received Nathan's Switchblade 24 oz 2-Bottle Belt. This style comes in four different colors and I received the fashionable Coral version. The belt retails for $49.99. This is a "one size fits most" belt and isn't available in different sizes. It is very adjustable however. 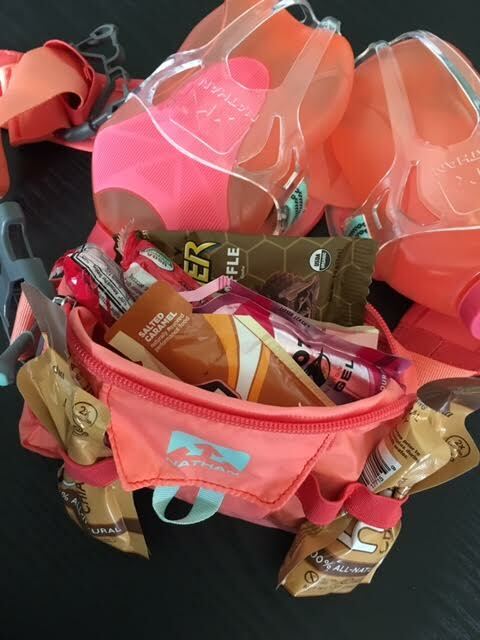 Nathan offers many different styles of hydration belts, packs and bottles to fit all of your endurance training needs. If you are looking for more or less for storage, size, water holding capabilities and different types of compartments, you will surely find an option that will work for you on their site. If this style or size doesn't suit your training needs -- look around. The bottles and pockets are movable throughout the belt and you can customize it to suit you. The belt is great for training or for races and the expandable zipper pocket has tons of rooms for storage. It's huge. The pocket is also compatible with iPhone 7 Plus for storage. The belt is pretty light wait as are the bottles. I liked the no-slip grip (referred to as "sticky" for no-slip) of the bottles and it was easy to remove while hiking or on a run. The 24 oz bottles were a little larger than other bottles I've carried with me around my waist. They were also really easy to sip from. There was also a lot of comfortable padding on the belt to prevent rubbing or chaffing and it didn't bounce as much as some other belts I've used. The belt didn't only include the large pocket, but there are also loops for external gel storage and even an awesome gel trash pocket. Who knew? Bottles are dishwasher safe and you are able to hand wash the belt. The belt hasn't converted me from a handheld to a waist belt yet. But I definitely liked it and having everything at my fingertips. I've been having a number of foot and shin problems, various aches and pains the past several weeks. I have been looking for something to easy the discomfort. I've been rolling out my legs and feet and icing a lot of my problem areas. And I have also been taking my own personal advice of ..... resting. Interesting concept, huh??!! The kids also treated me to their own version of a sports massage recently. It hurt so bad, but left me feeling better than I have in a really long time. I think they liked torturing me! But, the way it made me feel afterward, made me realize that I really need to schedule regular massages for my well-being -- or more than once every couple of years. 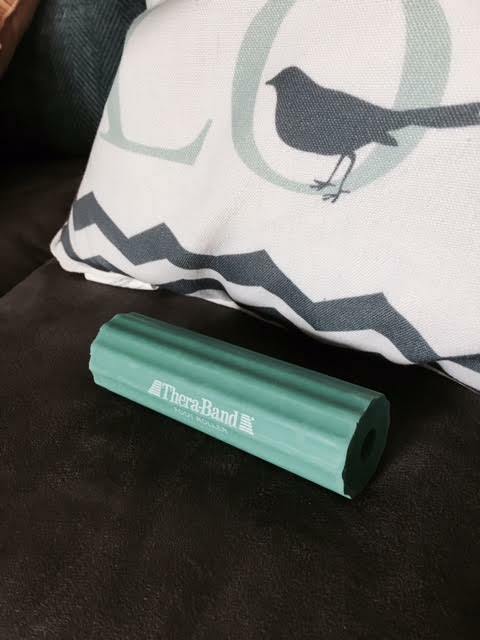 I also tried this small foot roller from TheraBand. I've had it in my box of goodies for some time and was excited to finally give it a try. I know that I have been struggling with plantar fasciitis for some time and just continue to work through it. I was hoping that this would help. This roller retails for less than $10 and provides great relief from pain and discomfort, just like your foam roller. This is a small investment for what you can gain from it. 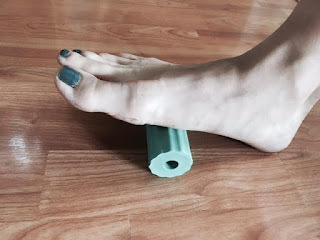 This affordable tool is very effective and provides temporary relief. 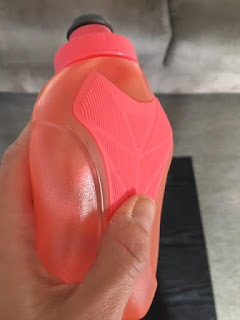 The really cool thing is - it can also be chilled or frozen to help reduce inflammation or pain. I loved it. And of course, my kids wanted to try it too. It was soft and formed to the shape of my feet. I also used the instructions that were included with the roller to perform a self rolling massage and various toe stretches. It did provide temporary relief. 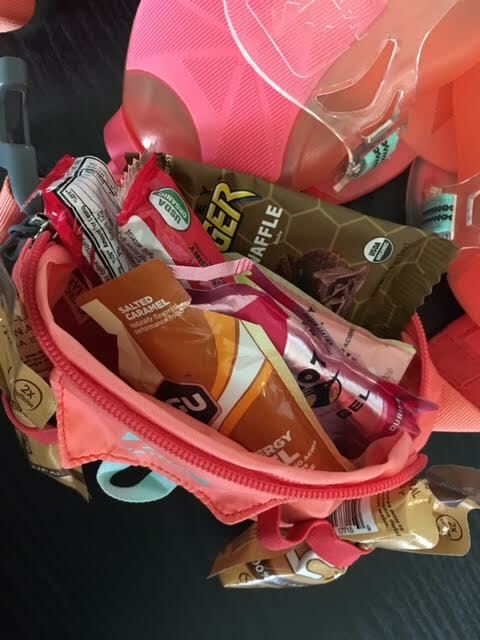 It is super small and portable and perfect for your gym bag or luggage if you are traveling to races. You could even use it under your desk at work to temporarily ease discomfort. 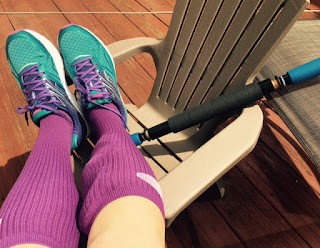 No one said that my husband married me for my beautiful marathon feet, blisters and bunions. They aren't pretty, but they carry me mile after mile. And I'm determined to keep going and stay injury-free. Join Running Diva Mom for a virtual training group - targeting a 5K (3.1 miles) in early September. This nine week training program will consist of three progressive runs/walks on your own each week and will begin July 2. Absolutely no experience is necessary, as runners will start with alternating running/walking one minute for twenty minutes. After nine weeks, participants will be able to run the 5K distance in 30-45 minutes. Participants will receive a full training program filled with additional challenges and activities and access to our private Facebook group for accountability, support and motivation. Participants should select a 5K in early September and may participate from anywhere. This womens running group is a great option for someone who has completed a 5K or two but isn't really interested in pursuing longer distances - such as a 10K or half marathon. This class will help you continue to fit running into your routine, while we complete longer run/walk intervals at our own pace for four weeks. Runners and run/walkers welcome. A training program with park locations will be provided which will include three workouts per week. The group will run together once per week on Wednesday evenings. Jogging strollers welcome. Four week class (Sept 27, Oct 4, Oct 11, Oct 18). Parks/locations rotate. Participant with the highest percentage of weightloss will receive a FREE ENTRY into the August accountability group.